In Fig. 40a we have a simple and effective use of complementary colors. 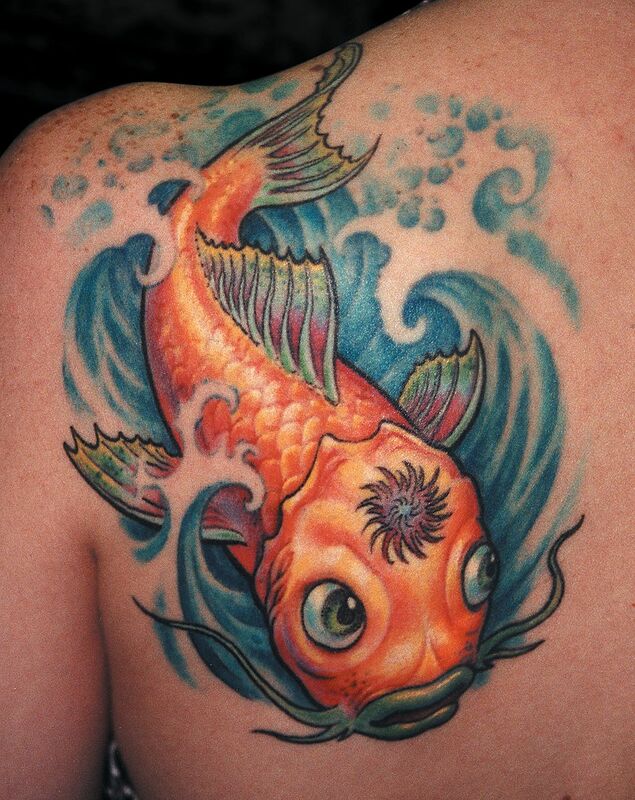 The water is done in blue with tiny amounts of blue-green; the koi is colored in bright orange and yellow. The orange naturally jumps forward from the blue, making it distinct and 3-dimensional. These same yellows and oranges would be much less effective with plain skin tone behind them; the fact of blue being the complement of orange is what makes it appear so bright. It seems that warm colors appear to jump forward from cool colors more so than the other way around; a blue foreground object with fire behind it may be less 3D than the warm-on-cool relationship of this koi design. In general, though, it’s safe to assume that warm colors tend to jump forward, while cool colors drop back. The stronger the color contrast, the greater the depth. We can use complementary color relationships not only between a foreground object and its background, but between the upper side of an object and its lower side, or the inside of an object and its outside edges. In Fig. 40b is a brightly colored lizard with an organic environment around it. 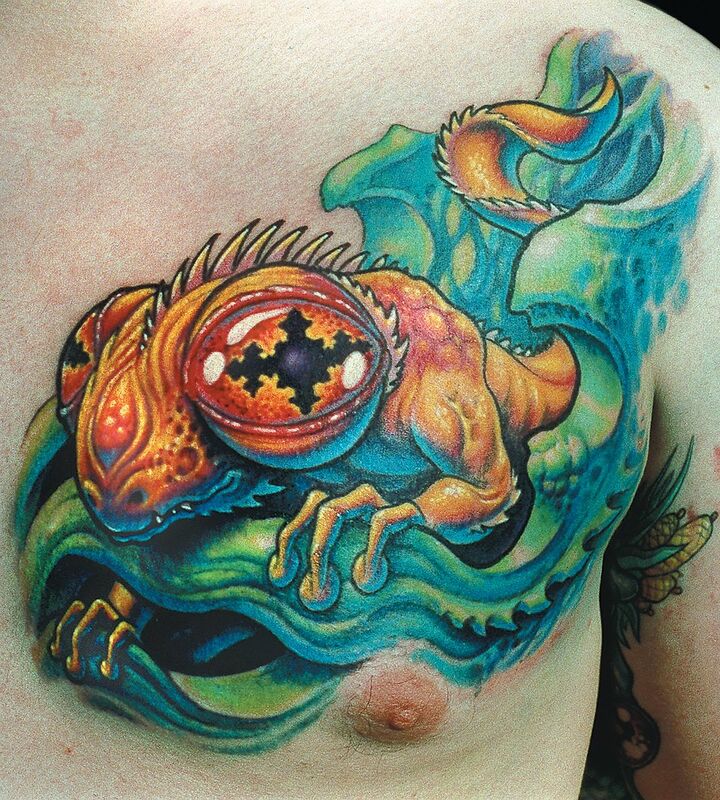 The upper sides of the lizard are colored in oranges, yellows and reds, which are the warmest colors, and its undersides are colored in blues and purples, causing these areas to drop back and curve away, giving its overall form a sense of dimension. In a similar way, the organic background objects are colored green on the top and blue on the bottom, making them appear 3-dimensional, but no yellow and white are used, giving it less dynamic range than the lizard and keeping the different elements from competing. Look closely at how the tail contrasts the background. The black outline and shading plus the white highlights in the tail give it a value range of 100; the primary blue versus the bright yellow and orange give it the full color range, also 100. So if we add up the color and value contrast in the tail, we’ve got a dynamic range of 200. However, the elements behind the tail neither rise to the zero of white nor sink to the depths of black; their valuerange is around 60. The green and blue are warm and cool compared to each other, but still have no more color contrast than about 40 (if a trip halfway around the color wheel is 100, a trip a quarter of the way around is 50, and so on). This gives the background a total dynamic range of 100, or about half that of the tail.